He’s partially right about Vietnam’s third-largest city, though he couldn’t have picked a more difficult target. Bama and I are the kind of travelers who could spend hours wandering a history museum stocked with artifacts. 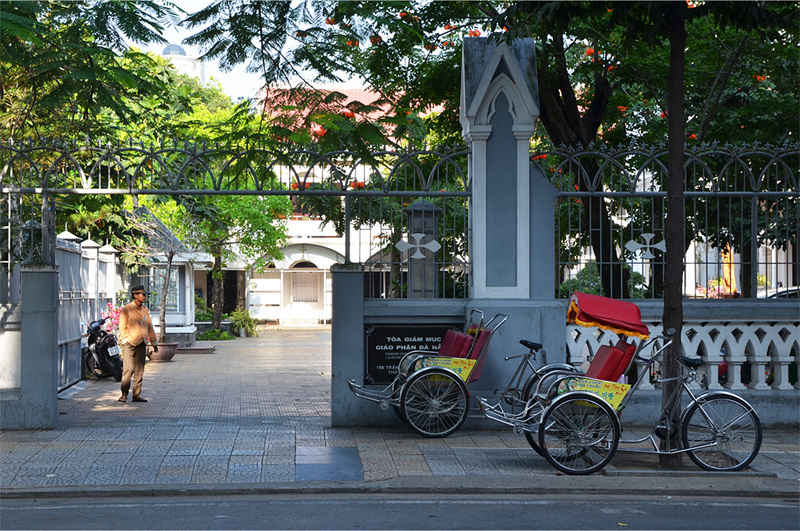 Having both grown up in Asia, we have both seen our share of banyan trees, while enormous Bodhisattva statues erected in the last 20 or 30 years rarely – if ever – pique our interest. We politely decline the man’s offer, but he still trails us from time to time inside the building, when he’s not latching on to other visitors. 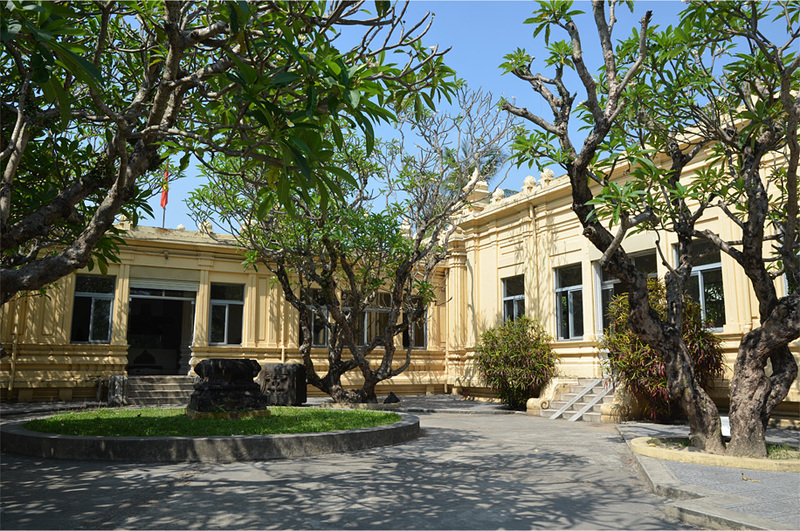 This museum holds the world’s largest collection of sculpture from the seafaring Cham people, who once ruled a Hindu-Buddhist kingdom spread across central and southern Vietnam. After tramping around a slew of ancient temples from Indonesia to Myanmar, Sri Lanka, India, and Nepal, I am finally beginning to recognize the divine characters hewn from stone. 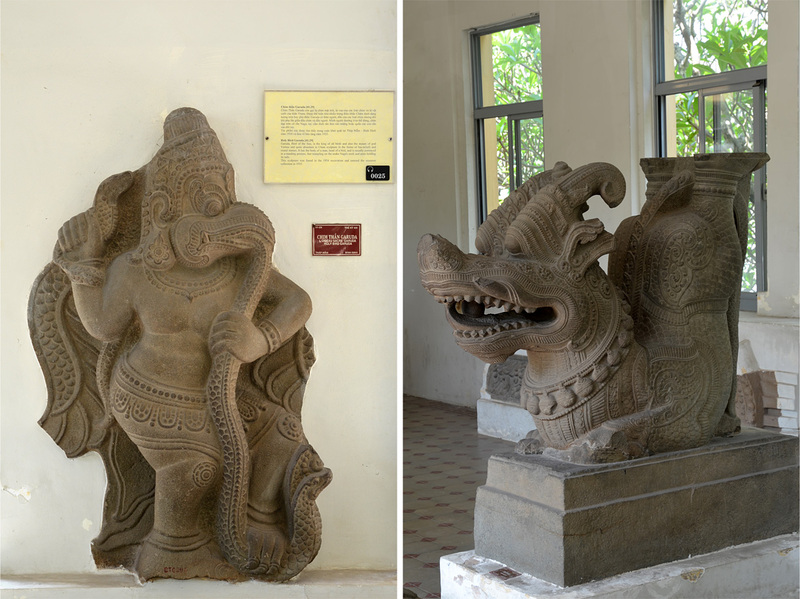 Bama points out a dvarapala statue, markedly different from the pot-bellied guardians seen outside many Javanese temples; we come across an intricately carved gajasimha, a hybrid creature with an elephant’s head and lion’s body; and find depictions of Garuda, a divine bird from Hindu-Buddhist mythology that is also the national emblem of Indonesia and Thailand. Elsewhere in the same hall, a magnificent 13th-century dragon strikes me as a uniquely Vietnamese creation. 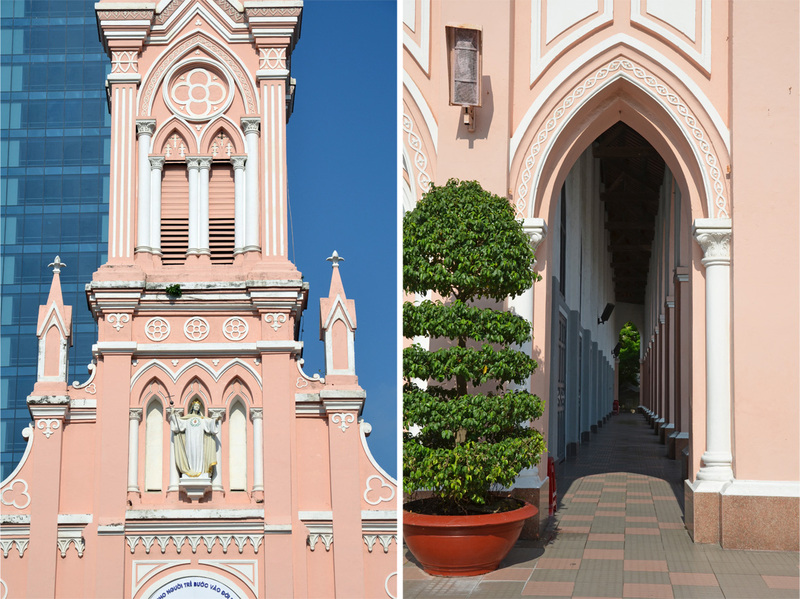 We’d already wandered the grounds of the candy-colored church earlier that morning – it was barely a block from our hotel. The man finally leaves us in peace, disappearing completely for the remainder of our time in the museum. Thankfully this is the only occasion when we feel pressured by touts in easygoing Da Nang. 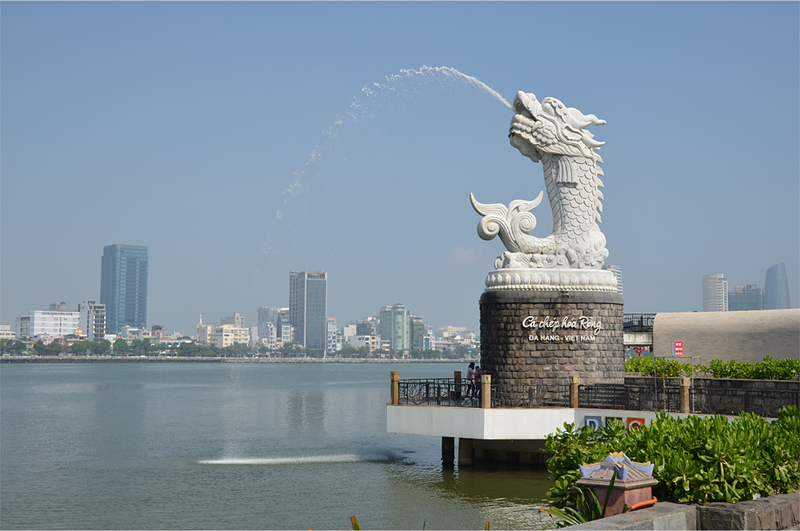 The gateway to central Vietnam is otherwise a showcase of the country’s economic progress, with monumental bridges spanning the wide, brackish waters of the Han River, and a growing skyline of high-rise hotels, balconied condominiums, and glassy office blocks. We walk past cartoon posters promoting a code of conduct for tourists: they warn against excessive public displays of affection, getting drunk, and making too much noise. 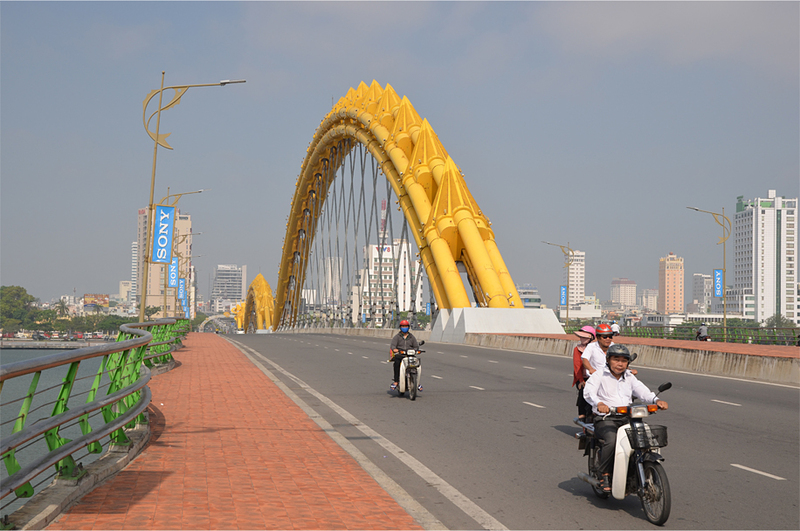 All told, Da Nang has aspirations to become more like the developed city-state where we boarded our flight to Vietnam. 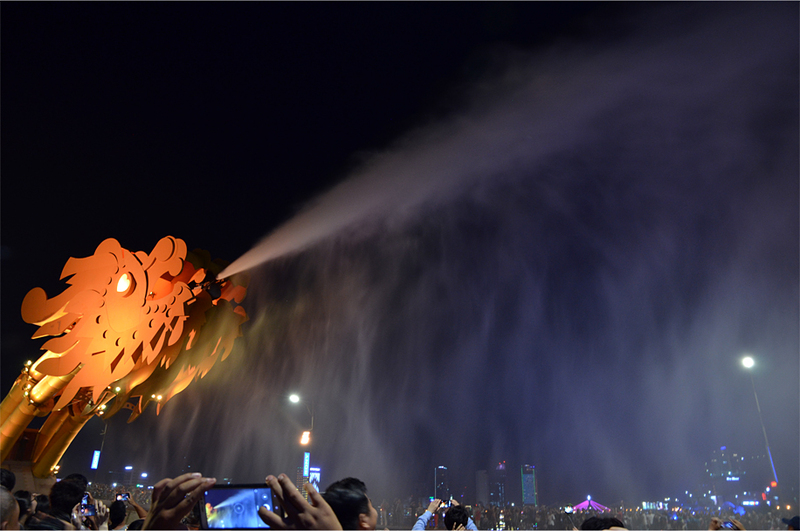 Singapore has the Merlion, and Da Nang has recently built a copycat version spewing water into the Han River. Bama and I quickly name this white marble creature the “Merdragon”; it rises from a pedestal beside a pier where padlocks dangle from the railings and heart-shaped lanterns sway in the breeze. A speaker pumps out a series of 80s and 90s love songs (think Ronan Keating’s cover of When You Say Nothing At All and Diana Ross singing If We Hold on Together), as happy couples take pre-wedding photos in the late morning heat. 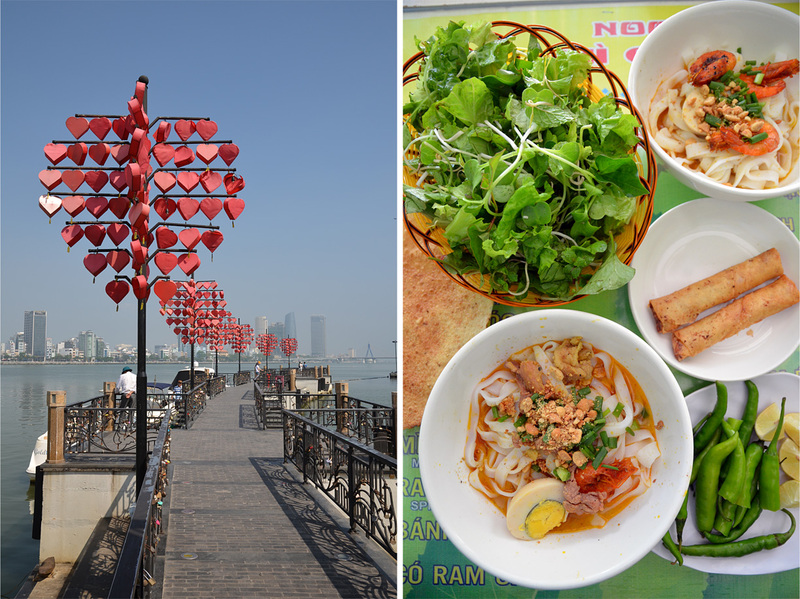 Da Nang is better known as a beach destination: there are no must-see-before-you-die landmarks or panoramic views, no must-do experiences in town, but Da Nang is a place where almost anyone can eat well. As a first rule of thumb, Bama and I eschew the pan-Asian and Western restaurants facing the Han River promenade; these offer the standard tourist fare at vastly inflated prices. 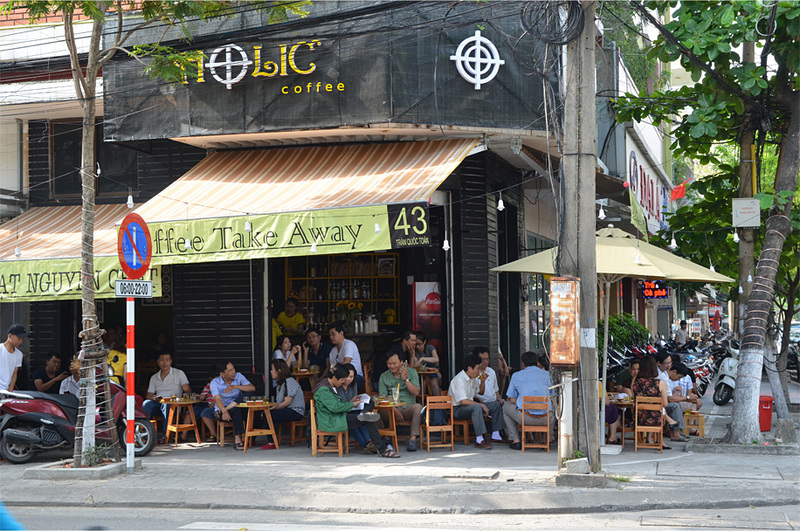 Instead we opt for the informal street-side eateries where benches and plastic chairs spill out onto the pavement. Our reward is the regional specialty mi Quang (Quang noodles) served with spring rolls, fresh greens, and a generously sized rice cracker at local institution Ba Vi, followed by a steaming bowl of pho at another stall, where the perfectly cooked rice noodles are combined with slices of beef tendon, the crunch of boiled bean sprouts, and aromatic sprigs of Thai basil and mint. 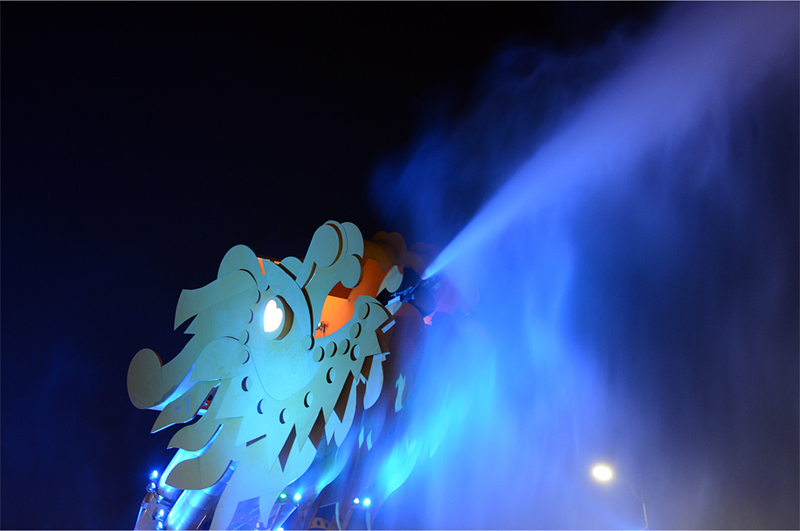 The city takes on a different character after dark, when cooler temperatures prevail and the riverfront promenade becomes a stage for aerobics sessions and group dances. 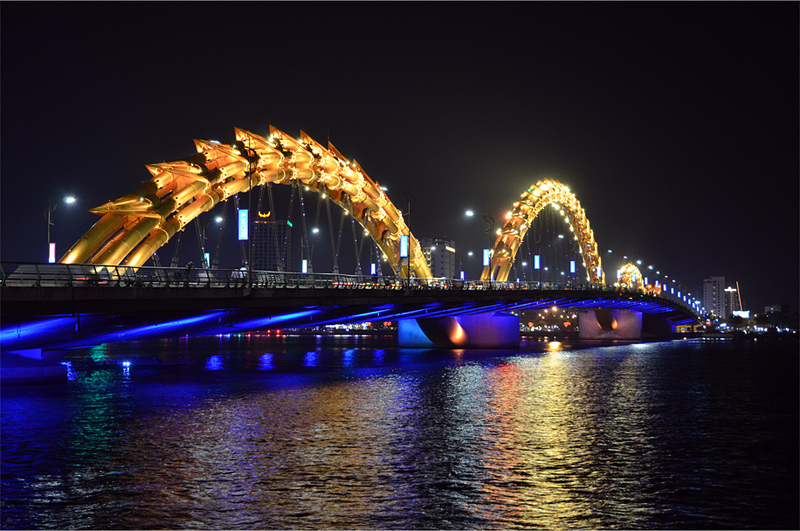 We cross the Dragon Bridge, encountering mobile vendors selling fruit and candy floss, as throaty melodies from a Vietnamese folk performance drift over from a thatched riverside enclosure. Mickey Mouse, Pikachu, and Doraemon are here too – or at least misshapen versions of them – offering handshakes and candies to passersby. …look closer and you’ll see that it has love in its eyes. I really enjoyed seeing the changes made since 47 years ago. 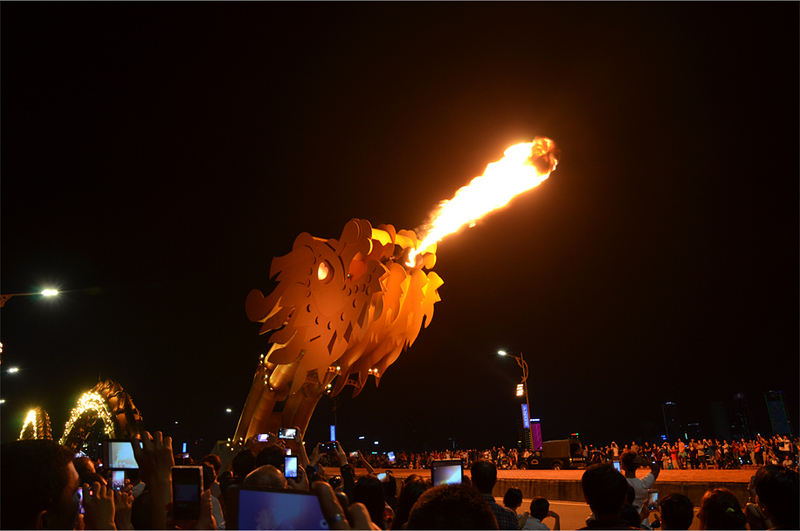 It was heartening to see the rise in prosperity and standard of living – I really felt that Da Nang was a showcase of modern Vietnam. 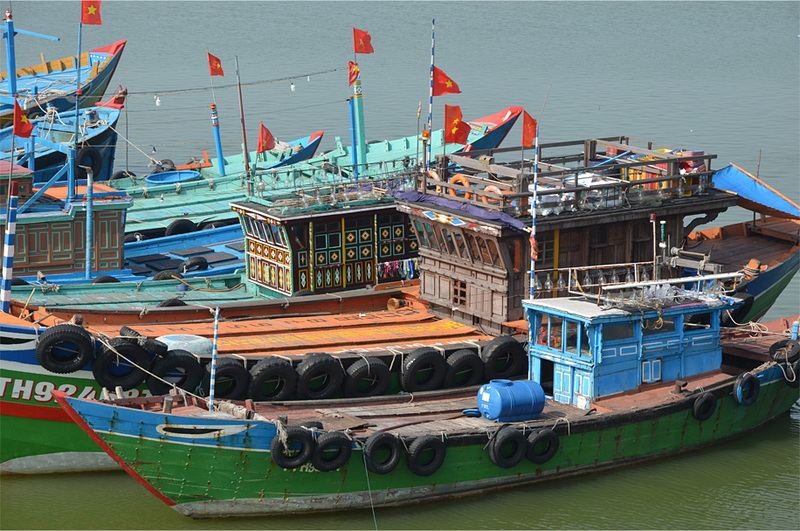 Da Nang has a lot going for it – it will be interesting to see how it evolves in five years’ time! 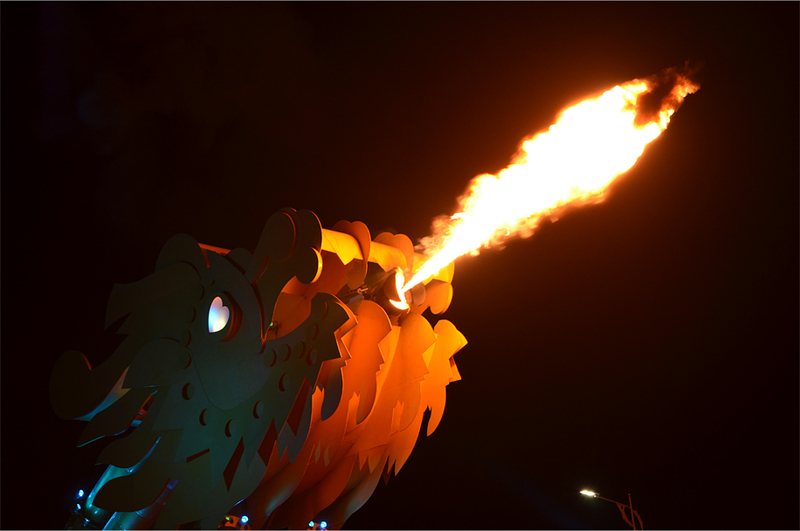 That dragon is epic! Great photos James. Thank you Alison! I think the bridge is ingenious – we were lucky to be there right on the weekend. Da Nang was indeed more interesting than I thought. I believe being host of the fifth Asian Beach Games last year, and the APEC summit later this year helps improve the city’s infrastructure. Interestingly, despite the rapid modernization, in Da Nang we actually had some of the cheapest meals on our trip. 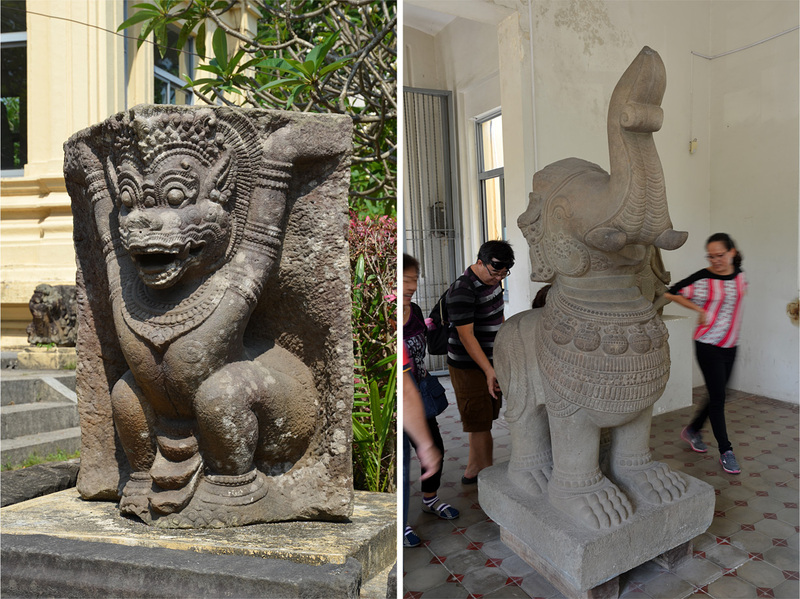 Speaking of the Museum of Cham Sculpture, I was intrigued by the fragments of a temple from Dong Duong. Such a shame the Vietnam War damaged almost everything on the ancient site, leaving us today with only some pieces of the once ornately-carved temple. 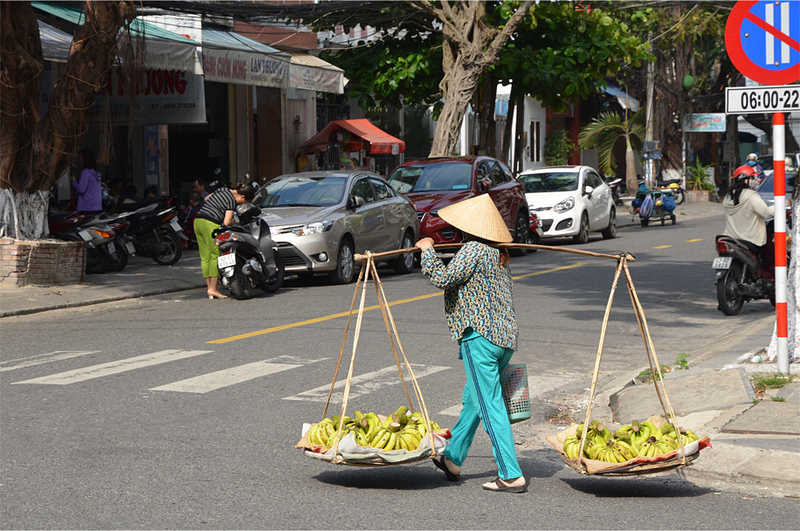 I guess the meals in Hoi An and Hue were generally more expensive because of their dependence on tourism. 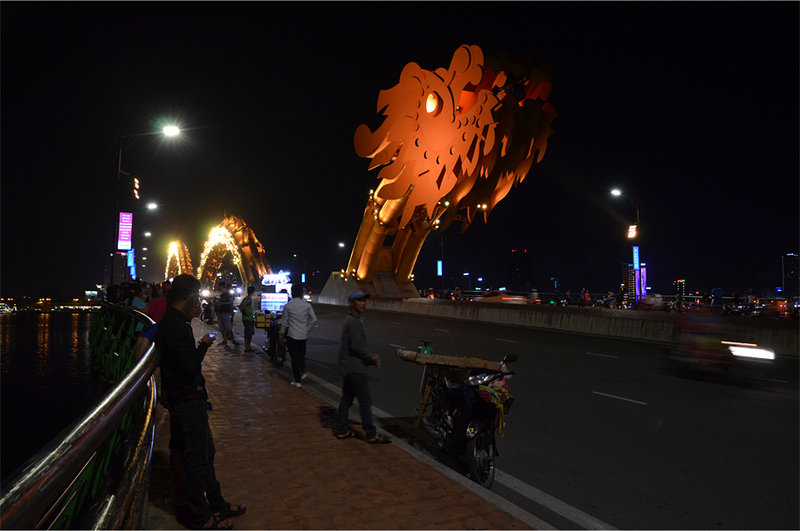 What I particularly liked about Da Nang was that fact that it was a normal city that was just going about its business (i.e. not flooded with visitors). I really enjoyed the Museum of Cham Sculpture – it was just the right size and I’m glad the artifacts were rescued from those sites before the wars of the 20th century! I entirely sympathize with not being enthusiastic about giant Buddha (or other) statues built in the last few years. It could be because we’re so used to seeing them… then again the majority come across as being quite tacky. Wah, Da Nang jauh lebih bagus daripada yang aku bayangkan selama ini. Aku pikir cuma kota kecil yang sepi. Ternyata cukup ramai dan meriah. Ya, Da Nang memang kota terbesar ketiga di Vietnam. Aku terkesan sama jalanannya yang bersih… kota-kota di Indonesia bisa belajar dari Da Nang. The city looks peaceful yet lively. You’re welcome, Nugie. 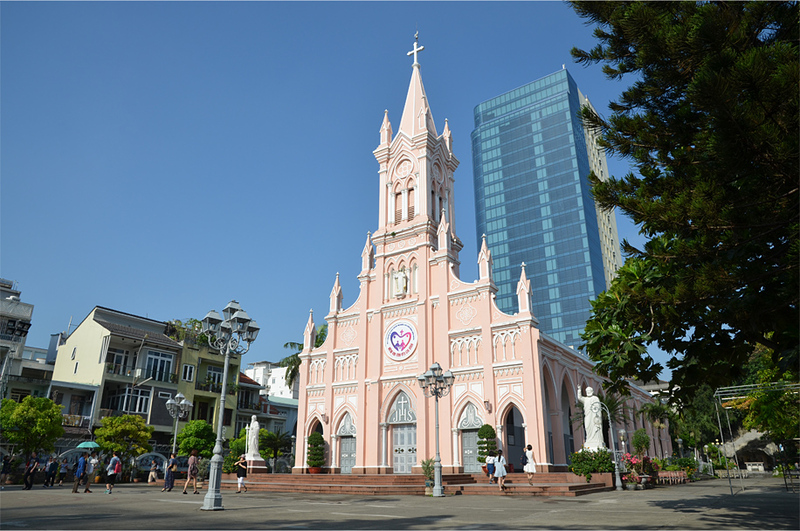 🙂 Da Nang is a really good starting point for a few days in Hue and/or Hoi An – it’s the nearest city to both places with an international airport. So many cool sights! Of course, I love the bridge, but I also like the subtle color and design of the museum. The Merdragon, the church, and the Love Pier are likewise eye candy, but again, I like the simple coffeeshop with its low stools just as much! Lex, I think you would find Da Nang just as fascinating as Bama and I did. It was fantastic to see how local people used the street as something of an extended living room, especially at night when temperatures were perfect and there was a consistent, cool breeze! 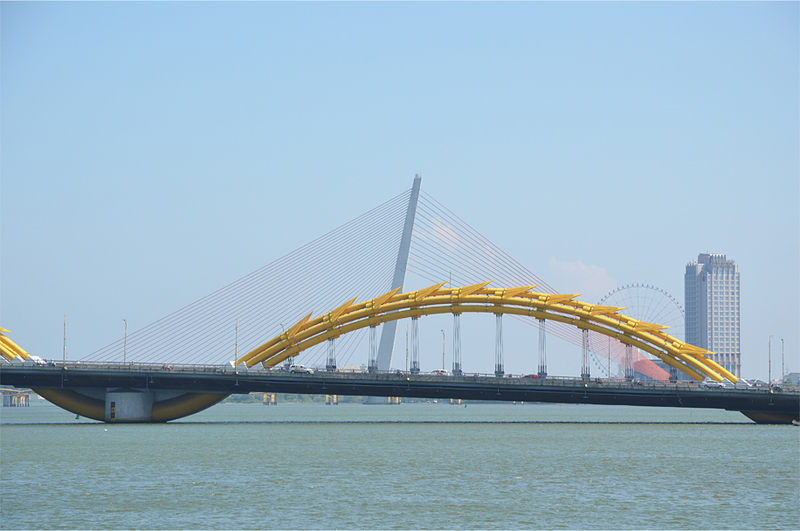 Yes, at first, I thought Da Nang is famous for its beach – based on what my friend told me haha! I’m not much of a beach person, so I only passed by that area on my way south to Hoi An. It did look quite beautiful, and there were a number of big-name hotels/resorts. Beautiful. 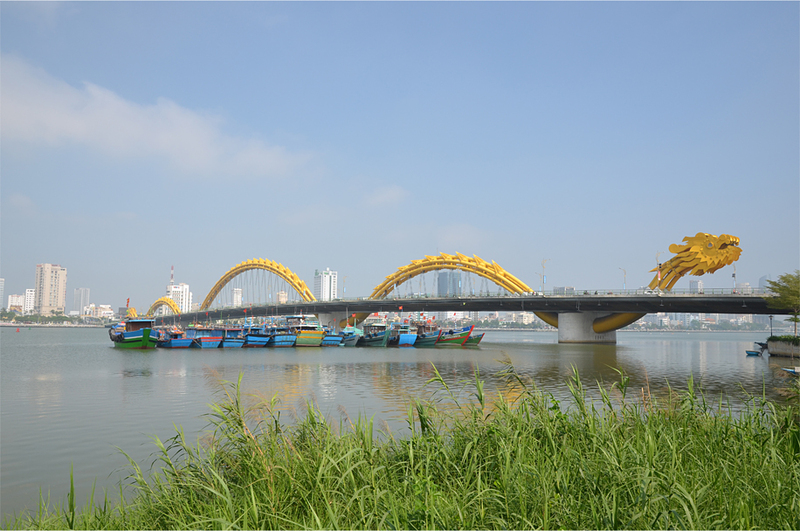 I crossed the Dragon bridge on my way to Hoi an. Could see the huge statue even from the Ang bang beach. It was stunning! Thanks! I didn’t end up going to that enormous Bodhisattva statue or the beaches for that matter – maybe next time.